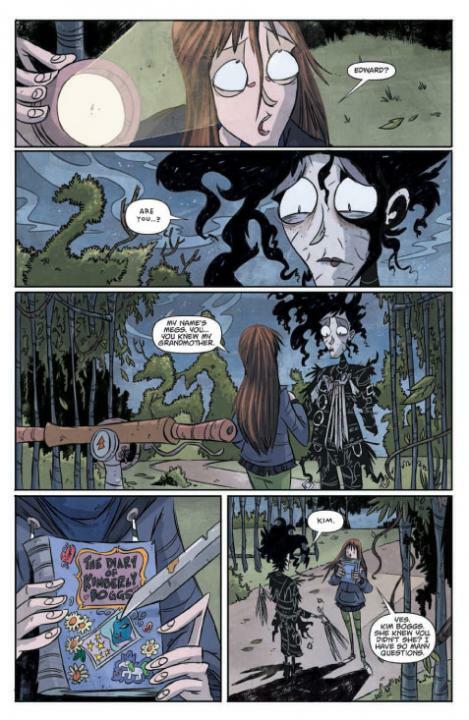 This new graphic novel is a continuation of the Edward Scissorhand’s story from Tim Burton’s 1990 film. That said, readers don’t have to have a background with the film to read and enjoy this fantastically illustrated book. Edward is a young man endlessly stuck in his permanent state. He was designed by a lonely inventor and created with supplies found on site, which unfortunately for Edward included a surplus of scissors which became Edward’s hands. He accidentally injures people or pets with them so he remains isolated in the decrepit inventor’s mansion. At the time of the movie he was in love with a girl named Kim. The book begins years later. On the anniversary of Kim’s death her granddaughter, Megan, decides to revisit Kim’s storage unit to learn more about the mysterious man, Edward, who never ages, is never seen, and is rumored to be a monster. Meanwhile, Edward attempts to resurrect another of the inventor’s children, Eli. Eli is more man than machine. He escapes from the mansion and goes into the town seeking a key to his heart- it’s what he needs to be a real person. The mythos of the monster/man fit neatly into the story’s visuals and compel readers to dig into the story even though it follows a predictable path. Fans of Tim Burton will be especially fond of this rendering as there are hints to his style throughout the book. The family looks like the one from the 1993 Burton produced show Family Dog. There’s a tree in the book which resembles the tree of prominence from Burton’s film Sleepy Hollow. Also present are Burton’s trade-mark swirls, deep colors and general mood. The story itself gets a bit weighted down by its conclusion. Is the boy Eli an allegory of the mentally disturbed? 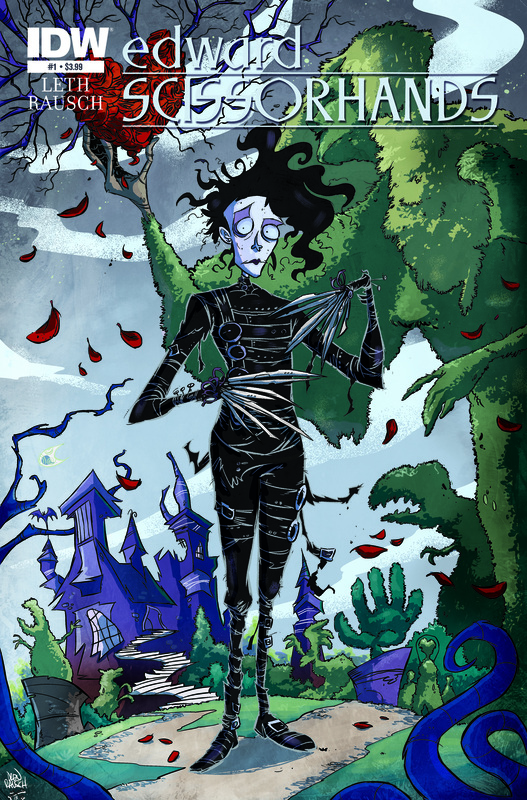 Enjoy this for the memory of or introduction to (depending on your age and experience) the weird and wonderful world of Edward Scissorhands. *Thank you NetGalley for providing me a digital review copy of this title in exchange for my honest review.